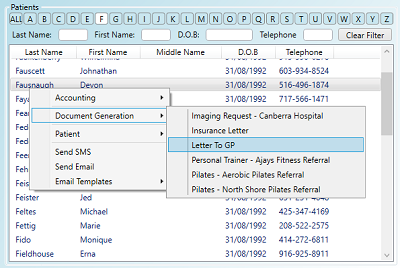 If you have lots of 'template' documents in your practice that you copy, edit and send to patients then you can move them in to Practice Master Pro and have them generate themselves with a single right-click. You can use merge fields to dynamically add personal information in to the documents automatically so you don't need to edit them any more. Your documents are automatically stored in the patient's record or patient notes and can be printed or emailed straight to the patient with a single click. If you do need to edit any of the documents, no matter what file type (Word docs, images, spreadsheets etc), you can do so and any changes will be preserved. 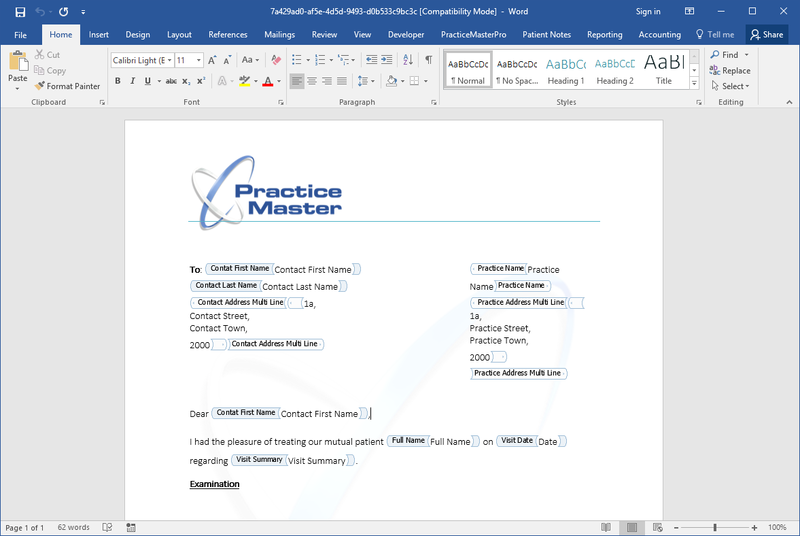 Because Practice Master integrates with your existing Microsoft Office software you can create professional templates that include images, backgrounds, watermarks, headers/footers and any other professional document features supported in Microsoft Word. You can even import supplier order forms or medical request forms and insert merge fields for your patient or contact data. 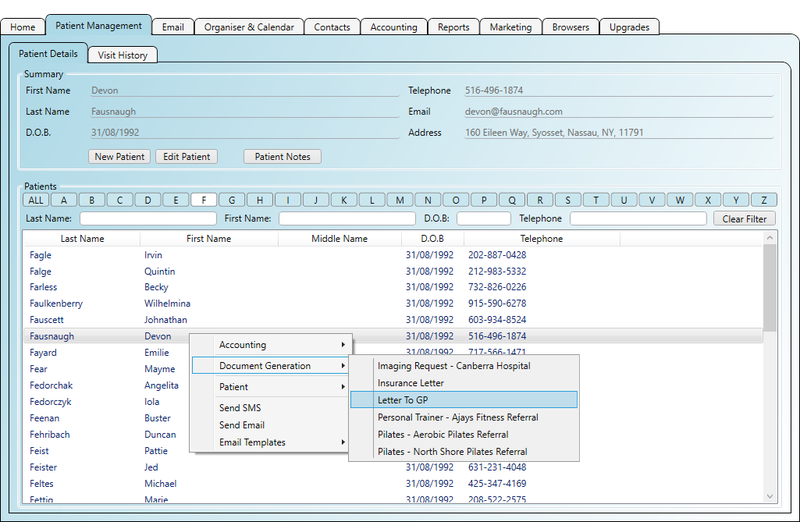 Then you can simply right-click to generate the filled in forms ready to email straight to the recipients. With Practice Master Pro all your documents and intellectual property is in one place, backed up and even accessible in the cloud. Because Practice Master Pro lets you create your letters or document templates using Microsoft Word you get professional results and you are not limited to selecting from pre-defined templates for your letters. You can use all the features and techniques in Word you are familiar with including images, backgrounds, watermarks, headers/footers and any fonts/font sizes/colours you choose. If you need to email your patient's documents you can do so with a simple right-click. You can select multiple documents if required in to a single email and even convert Word docs to PDF before the email is sent. If documents are emailed to you then you can make use of the email systems document integration and automatic patient matching to save the attachments straight in to the patient's record. This makes it easy to manage any documents you may be passing to and from the patient to get their feedback or answers to questionnaires. 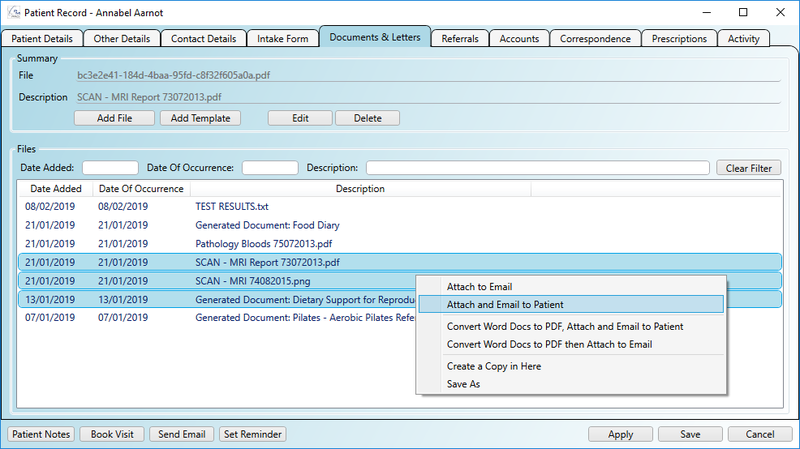 Associate your document templates with any combination of Patient/Contact/Visit so you can generate your documents when you right click them. The generated documents are stored in the records of the Patient/Contact/Visit and can be edited or emailed as attachments with a right-click.